There was a bomb threat at the Chase Bank branch in Warrendale. According to a witness inside the bank when it happened, a man tried to cash a check there yesterday morning. When the teller informed him that she wouldn't be able to cash it because he didn't have enough money in his account to cover it, he allegedly said, "Either you cash that check or I'm going to blow this place up." At that point, the bank went into a "lock-down" mode where no one was allowed in or out of the bank and the Detroit Police Department was called in. A search conducted by DPD of the man who made this threat, his truck that was in the parking lot and another gentleman who was in the truck revealed that there was no bomb or any other weapons present. 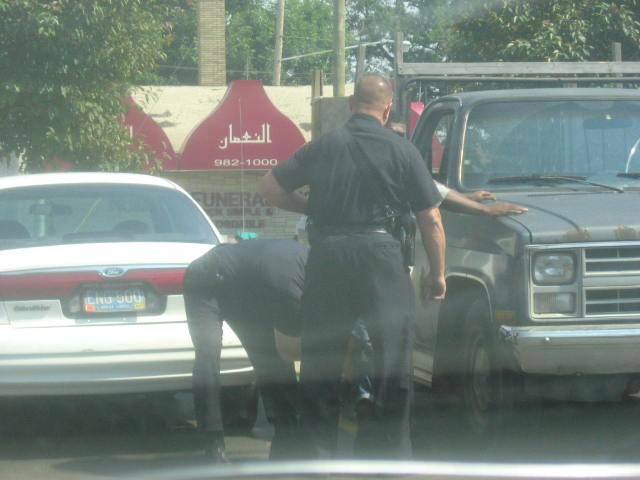 The photo above shows police officers searching the gentleman who was waiting inside a truck belonging to the man who made this bomb threat. I took this photo through my car's windshield and - yes - I do need to clean my car windows. It wasn't clear what charges, if any, would be filed against the man who made this bomb threat. Regardless, I'm glad that DPD got there so quickly and that there wasn't a bomb for them to deal with.